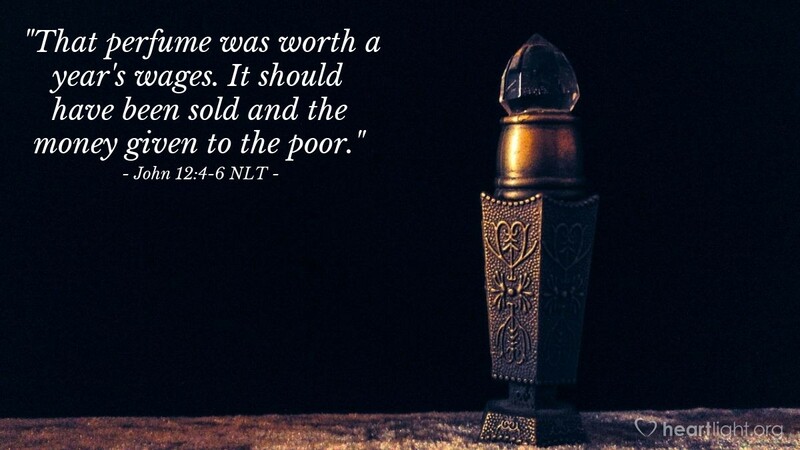 But Judas Iscariot, the disciple who would soon betray [Jesus], said, "That perfume was worth a year's wages. It should have been sold and the money given to the poor." Not that he cared for the poor — he was a thief, and since he was in charge of the disciples' money, he often stole some for himself. Ever notice that some people at church can criticize much more freely than they can praise, encourage, serve, or sacrifice? Satan has a way of finding greedy and selfish hearts to use pious sounding words to criticize those who are willing to sacrifice. Does that mean we give up on the church? Well, did Jesus give up on his disciples because one of them was a greedy traitor, one was always overstating his faith, and the rest were often confused? Of course not! Where else would we want a person wrestling with heart problems to be than among God's people! The real issue is whether those who lead give in to pious sounding critics or gently confront them with the truth as Jesus does Judas in the next verses. Too many who sacrifice and serve are not affirmed because someone else criticizes them. Jesus shows us this must not be! Holy and loving God, please open my eyes to people who are serving you extravagantly, then use me to affirm them and encourage them in their service and sacrifice to your Kingdom. In Jesus' name, I pray. Amen.